I have been a little slow to share this article, published in Qualitative Research at the end of 2018, that I wrote with my colleagues Michael Gallagher and Jeremy Knox. It reports on a methodological exercise we took in London where we brought together ethnography, multimodality and urban walking. This involved making an unscripted walk through central London that we attempted to document through photographs and field recordings. This video goes some way to capturing what we did. In the moments after drawing our excursion to a close, Michael, Jeremy and I began working through the data, generating some ideas that we presented at a conference the next morning (and we discuss in our article). This includes the potentialities of combining urban walking and ethnography, but also the limitations in our attempt to generate data as a way of reflecting on our relationship with the city. Since undertaking that first exercise in London, Michael and I have subsequently adapted the approach as an alternative form of conference paper where we orchestrated a digitally-mediated excursion through the centre of Bremen. We have also more conventionally presented on this and similar methods, all of which combine digital technologies with urban exploration. A short report on the walking activity that I delivered with Michael Gallagher last week, our contribution to the 3rd Bremen Conference on Multimodality. Through this 'paper-as-performance' Michael and I sought to make the case for the theoretical and methodological compatibility of multimodality and mobile learning, for instance as a way of investigating our urban surroundings. We also wanted to raise questions about the complex relationship between researcher and the digital, and how this might affect work within multimodality. You can read the background to our exercise on this project site, including a theoretical rationale which explains for instance why Smartphones and the Telegram app were central to the experience. We can't control the weather: surveying the skies above our meeting point ahead of the excursion. ​Grab your coat, pick up your smartphone. ​Leave the seminar room behind. Hop on a tram and meet us outside the Hauptbahnhof at 18:30. Open your eyes, open your ears. Take an unrehearsed walk through the city. ​Who knows what we might learn? Rather than re-tracing what took place during the excursion I am instead making a record here of some of the key ideas that I will take away from the experience. This following points build on feedback we received after the excursion, as well as subsequent conversations between Michael and myself in the following days. When the city is our richly multimodal text, mobile learning is well equipped to support a different ways of investigating our urban surroundings. Our excursion reaffirmed the value of taking learning outside the classroom. Leaving the seminar room behind seemed to bring a new energy and insight to the conversations that took place during the walk. ​Without suggesting that the classroom or campus is always an entirely safe environment, by taking to the street we open the possibility of a broader and perhaps less predictable range of hazards: traffic, construction work, people, weather. The Smartphone can support the gathering of a range of data that until very recently would have been the preserve of those with a high level of technological access and technical sophistication. Sound, image, direction and distance can all be collected with a few clicks. Having pointed to the impressive data gathering possibilities of the Smartphone, for the time being at least, they are unable to adequately account for the way that taste, smell, touch and other sensory phenomena shape our meaning-making (and the way they sit in juxtaposition in the moment). The sophistication of our digital devices means that they are able to record and reproduce representations of the city that can be noticeably different from what was experienced in the street. Complex algorithms and code present an 'enhanced' picture of our surroundings on screen. We wish to thank Andrew Kirk, Cinzia Pusceddu-Gangarosa (both University of Edinburgh) and Ania Rolinska (University of Glasgow) for pavement-testing earlier versions of the activity described here. Meanwhile Jana Pflaeging (Universitat Bremen) enthusiastically supported our plan to deliver this activity as part of the 3rd Bremen Conference on Multimodality. Following a path which deviates from the central interest of my Doctoral research, I’m spending a bit of time this afternoon drafting a paper for the Vizualising the Street conference in Amsterdam this June. The conference is being hosted by the Amsterdam School for Cultural Analysis (ASCA) Cities Project and will explore the impact of contemporary practices of image-making on the visual cultures of the street. Along with my colleagues Jeremy Knox and Michael Sean Gallagher I will be arguing that in order to better understand the city we need to pay greater attention to the aural character of our environment. This isn’t about disregarding the visual, but instead asking what happens when we consider sound alongside sight, and what implications this has for our ability to ask questions about our relationship with the city. Still in Italy, in his essay Recording the City: Berlin, London, Naples, sound artist and composer BJ Nilsen describes how sound recordings provide us with high levels of detail whilst helping us to travel back to the field site. It is midday, outside a pescheria (fish market) somewhere in the old town of Naples, I have chosen not to look at my map and now I am lost. Taken in by the sound and activity of the fish market I decide to stick around for a while. The only recollection of me every being there will be my recordings. Listening back I can almost visualize exactly what I encountered, even faces, and although my memory reads in a hazy dreamlike quality, it is filled with information. (2014, pp. 57-58). Returning to the Visualizing the Street conference, the paper I am writing just now requires that Michael, Jeremy and I arrive a day ahead of the conference in order to get lost in Amsterdam, just as Nilsen describes in his wander around the pescheria in Naples. The route we choose to navigate through Amsterdam will certainly be influenced by the sights that grab our interest, however we’ll also have an ear closely tuned to the sounds coming from the courtyards, canals and cafes that we encounter as we attempt to draw meaning from the streets of Amsterdam. Nilson, B.J. (2014). Recording the City: Berlin, London, Naples. In The Acoustic City, Gandy, M. and Nilson, B.J. (Eds). Berlin: Jovis Verlas. pp. 57-58. As background reading for a conference paper I'm working on, I've been reading about Psychogeography and other approaches to exploring and thinking about urban space. 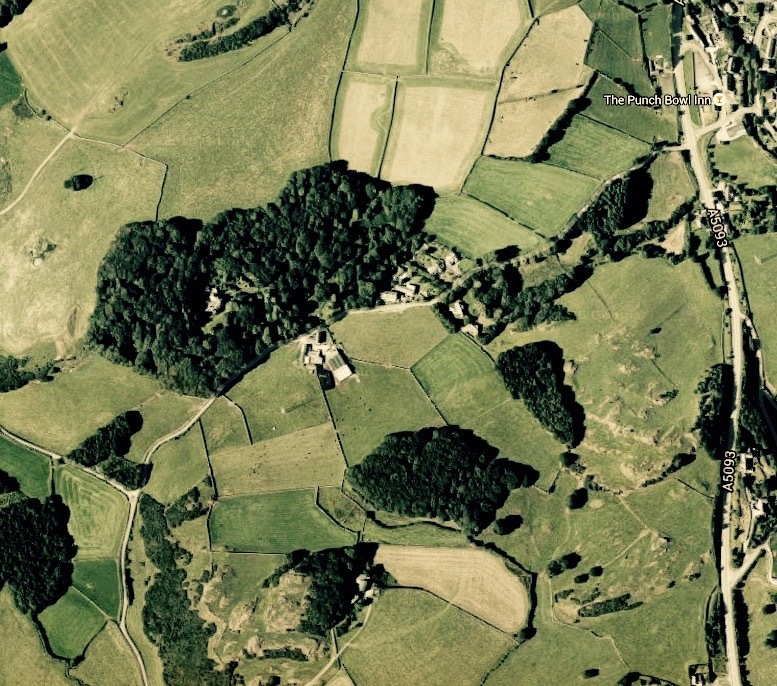 In his engaging (2010) study of the subject, Merlin Coverley presents Psychogeography as being interested in the places where Psychologogy meets Geography. Although 'nebulous and resistant to definition’, Coverley proposes that the different approaches to Psychogeography traverse some areas of common ground, most notably the pursuit of urban walking. This is often accompanied by what Robert MacFarlane (2005) describes as a calling to ‘Record the experience as you go, in whatever medium you favour: film, photograph, manuscript, tape'. How we approach ‘urban’ is also open to interpretation amongst Psychogeographers, shown each weekend in the routes followed along Fife coastal paths, and beyond the periphery of the London Orbital. Just as the city’s boundary is breached by lines of transport and communication, the parameters of what constitutes urban walking becomes blurred. ​And so a late-December walk through the growing darkness of the west Cumbrian countryside provided an opportunity to document the communications towers and power cables that we encountered on our winding path through the hinterland. The high tension lines pictured ibelow talk to us about the relationship between city and country, at the threshold between Psychology and Geography. It was only at the end of my walk that I became aware of plans to replace the pictured pylons with towers twice the size. At the same time I learned about a resistance campaign amongst residents along the planned route. High tension at the point where Psychology meets Geography. Coverly, M. (2010) Psychogeography. Pocket Essentials, Harpenden. MacFarlane, R. (2005 ) 'A Road of One's Own'. Times Literary Supplement, October 7. After fourteen enjoyable years working in widening access at Lothians Equal Access Programme for Schools, I'm about to follow a different path as I embark on a PhD in the School of Education at Edinburgh University. Although my departure is temporary rather than permanent, my colleagues were keen to mark the occasion and proposed that we finish early on my last day to take a leisurely stroll around the city, stopping for food and drink along the way. The problem with this plan was that a care-free amble around central Edinburgh during the Festival season would need to navigate crowds of visitors and performers. Instead, I put together a route that would take in some of the city's quieter closes and streets, whilst at the same time visiting some of the locations that have featured in my working life over the last fourteen years. Fittingly, we began in George Square where I was first interviewed for the job that I'm now taking a break from. Some hours later our journey drew to a close outside Moray House School of Education where I will take my first classes as a PhD student later this month. To add wider interest to our walk, I proposed that as we passed different sites of interest we should consider how they had changed over time. Thus, before setting out on our adventure I searched through the digital archives of the National Library of Scotland and SCRAN and bookmarked a series of buildings, streets and squares that we would likely pass on our route between George Square and Moray House. The different sites are foregrounded on my iPad in the images below. There's a juxtaposition here not just of new and old buildings, but of traditional and digital approaches to capturing images. Something I like about the images is the trace of my work colleagues: their hands, cagouls and partial on-screen reflections. Bearing in mind how closely we have worked, it was fitting that my colleagues should have a presence within the images . Another thing that strikes me about the images is the occasional lop-sided positioning of the iPad, reflecting the architectural imperfections and character that make up this part the city. I also captured a short ambient audio recording at each site we visited. In a second representation of the collected data, the video below combines the sight and sounds of each of our stopping points. I think the video offers different insights into the same locations captured in the earlier slideshow. An obvious example would be how our journey was accompanied by the almost constant hum of traffic, even when there were few or no cars in view. Elsewhere, the sound of music, a child crying and a passing conversation about a visit to the zoo reveal a warmth, humour and emotion that isn't always present when we consider the photos in isolation. The way that these different semiotic resources converge to create new meaning – and to contest the ideas we might draw from a single mode in isolation – is something I have touched on before. In January of this year, alongside my digital education colleagues Jeremy Knox and Michael Sean Gallagher, I undertook and then presented an exercise in multimodal autoethnography in a district of London. We came to the same conclusion: by tuning into the gathered aural data we were able to see beyond the edges of the snapshots we had taken of the parks, pavements and public houses of EC1. The way that the introduction of sound contests the impression of contemporary Edinburgh presented in the slideshow prompts me in turn to consider whether the same rules might apply to the archived images. Or to put it another way, if we somehow had access to sound recordings taken at the time of the photographs of old Edinburgh, would we draw different conclusions about the stories that appear to be unfolding in some of the images? I wonder whether our understanding of how we used to live that we might take from the apparent calm and tidy order of the archived images, would change if we were to hear the sounds pouring from the sepia-tinged breweries, printworks and classrooms that dominated Edinburgh's Southside a hundred years ago? 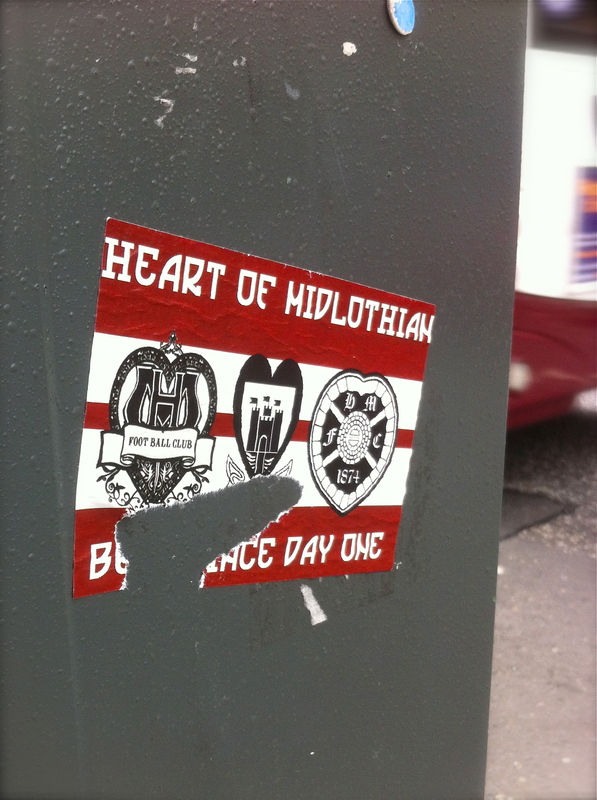 Over the last two years I’ve been recording traces of football fan culture in my neighbourhood, to the south of Edinburgh’s city centre. This exercise initially came about through a desire to try out a new camera, combined with the fact that pushing my 2 year-old son around in his buggy was a sure-fire way of getting him off to sleep. Hundreds of miles and hours later I've decided to share some of the photos and stories they tell. 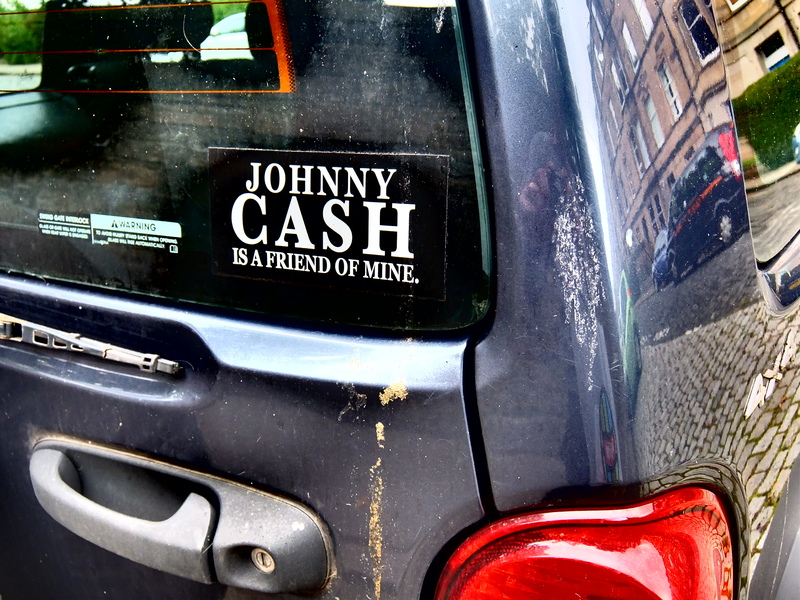 I've collected the most interesting images in a slideshow below and then, further down, have mapped them onto the streets of Edinburgh's Southside. Through repeated excursions I became aware of colourful stickers attached to lampposts, recycling bins and other bits of everyday street furniture. 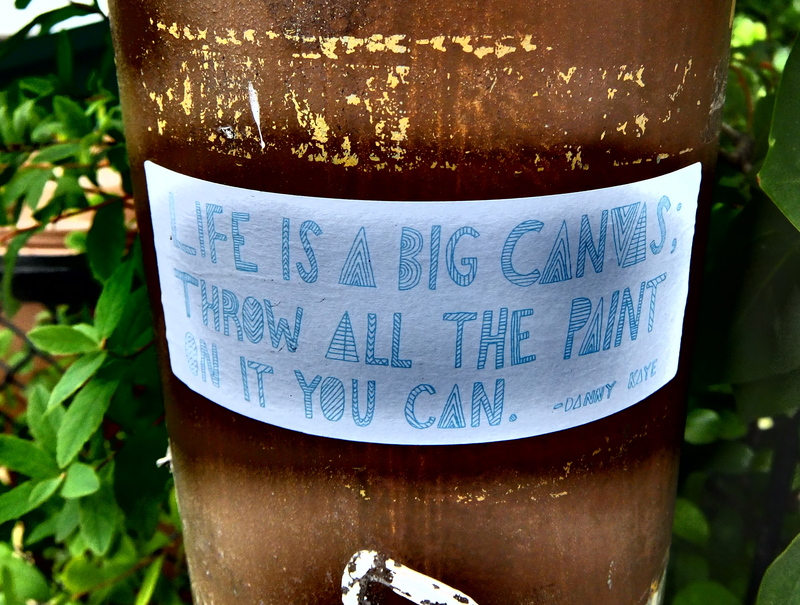 If this sounds like an unglamorous pursuit, on the contrary I encountered Danny Kaye and Johnny Cash as I walked the lines of tenements that characterise my neighbourhood. 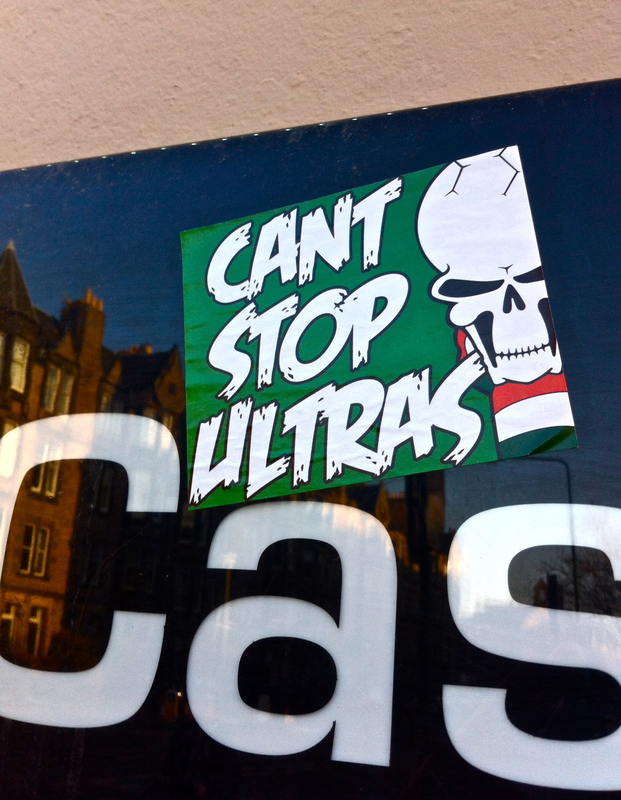 Some of the most interesting stickers were those bearing the identity of football Ultra groups. Ultras, in case their existence is new to you, are groups of highly organised and often politically-motivated football fanatics. They have an investment in their chosen club that goes beyond the 90-minutes-plus-time-added-on and manifests through colourful choreography, carefully crafted banners and controversy. There will frequently be fireworks when Ultras assemble in their chosen area of the stadium. 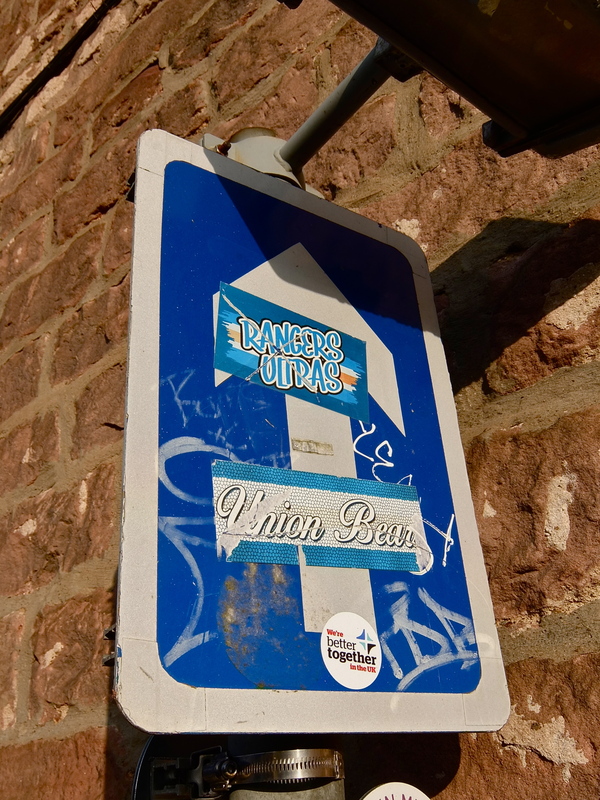 Looking beyond the imagination and humour of some of the stickers, I was interested in the way that their presence felt out-of-step with the calm order of the residential streets, schools and shops where I found them. Marchmont isn’t Merseyside and The Meadows is a long way from the Maracana, both figuratively and literally. 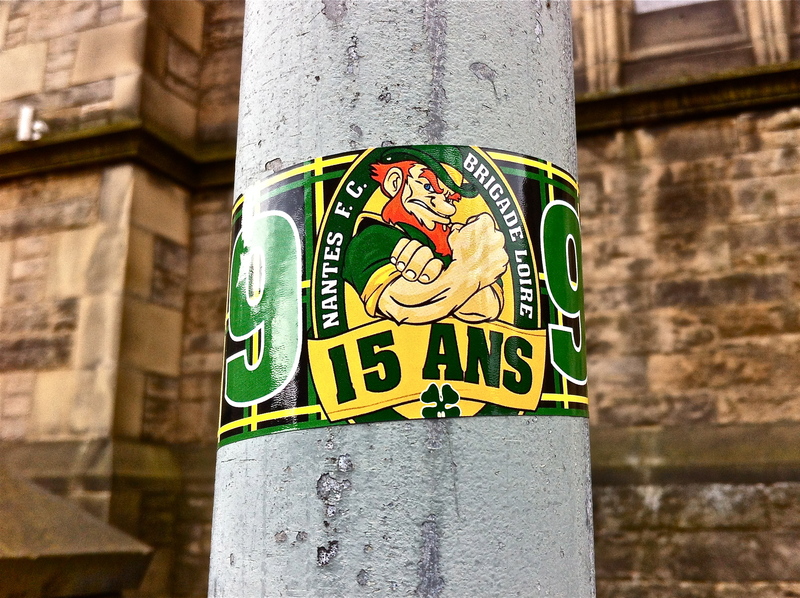 To illustrate the point in a very blunt way, I’ve never queued behind the Green Brigade at the cash point on Thirlestane Road or nervously exchanged glances with Ultras Nurnberg on Bruntsfield Place on my way to get the croissants. And yet their presence was to be found attached to the physical material of the street - in fact they became a part of it's materiality, its personality. As I became aware of this curious jarring I changed my approach and set out to record each sticker against the backdrop of its surroundings. This resulted in some amusing juxtaposition that wasn’t always apparent at the time: aggression in front of a place of worship; a zombie gathering set against a leisurely family outing. Hover over the map and then a hotspot to view a low res picture of a sticker in it's location. Over time these vinyl calling cards became more commonplace and I altered and extended my excursions to take in different paths, parks and other public spaces. The derelict land and industrial units around the Union Canal evoked a battleground as different Ultra groups competed for eminence. 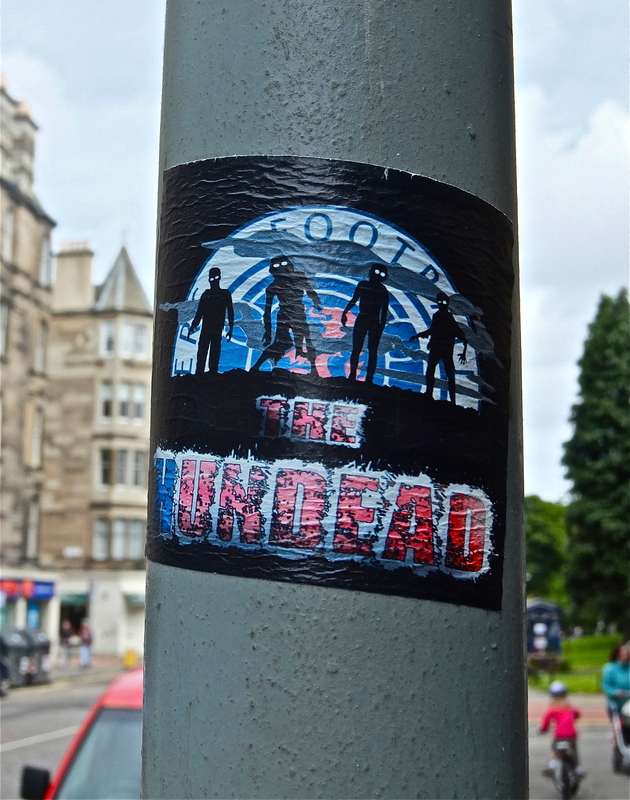 The message was clear: our football might be mediocre on the pitch but our fan artistry rises above all others (and is placed high enough up this lamppost to make it difficult for rival fans to deface or remove it). 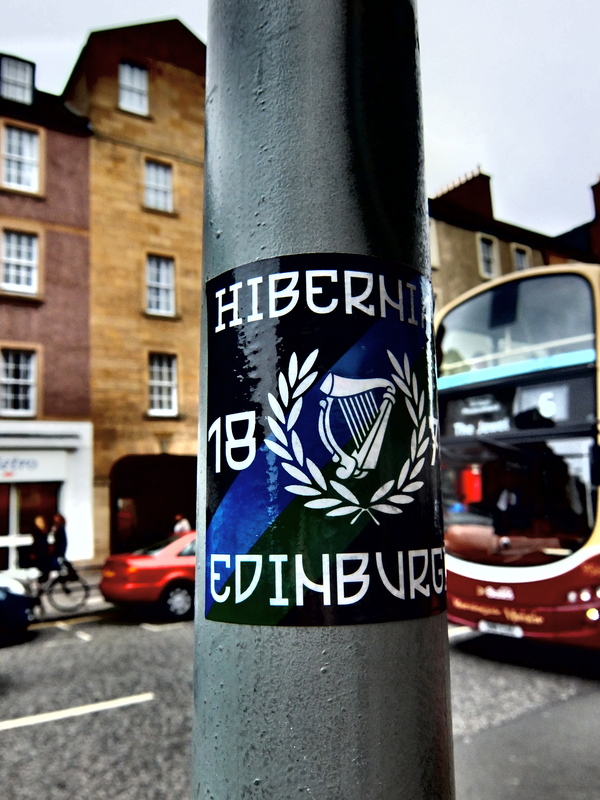 South Clerk Street presented a similar story of conflict as the different sides of the road became the opposing ends of a football ground: Hibs versus Hearts at Easter Road, at Tynecastle and then spilling out onto the lampposts and postboxes of the Southside. There was also serendipity in this documenting of fan culture. Without it ever being my intention a number of photos taken during the Summer and Autumn of 2014 inadvertently revealed the political climate in Scotland at the time. When the story of Scotland’s independence referendum is told it’s likely that it will be accompanied by images of politicians, press calls and orchestrated mass rallies. What will mostly be overlooked, I imagine, is the everyday appropriation of the street, as citizens of different hues pinned their sticky-backed colours to the lampposts and signs of their neighbourhoods. Better Together with the Union Bears. 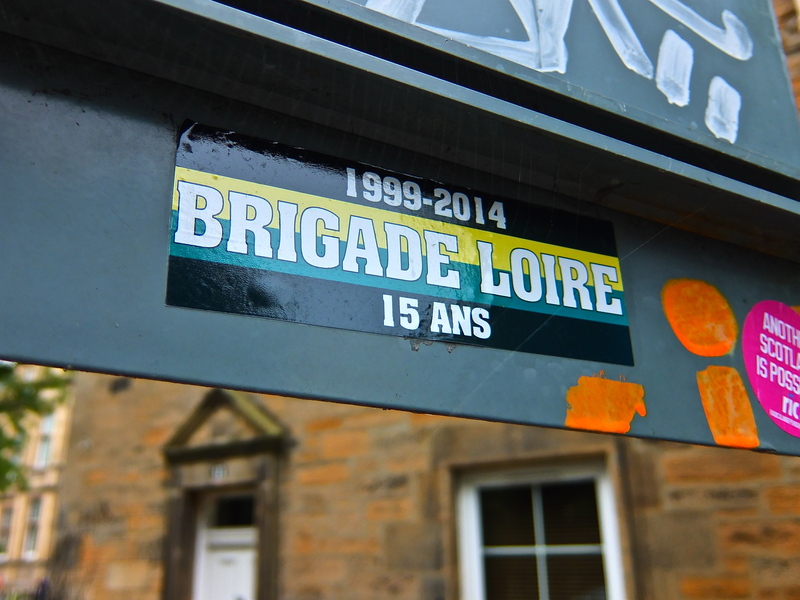 Another Scotland is possible with the Brigade Loire. And they say football and politics don’t mix. If there’s any value in this exercise (beyond learning how to use my camera and helping my son off to sleep) it’s that this approach can tell a story about what was unfolding within a specific part of the city over a particular period of time. Perhaps the gathered images can be seen as a capturing of the moment that will be overlooked in conventional histories of Edinburgh, and in the websites and brochures that are used to entice visitors and investors. 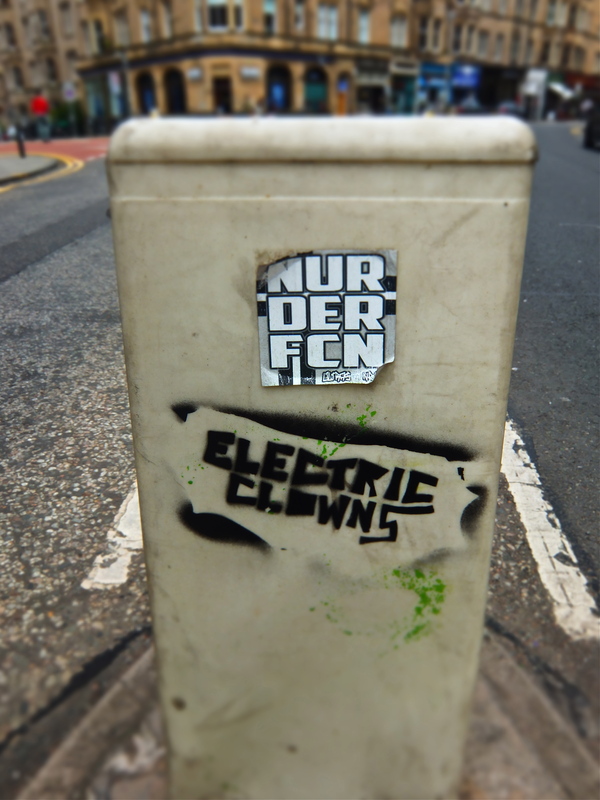 If Edinburgh Castle and Arthur’s Seat are immovable rocks in the city’s landscape, there's also value to be found in turning an eye to the ephemeral: the minutiae of our everyday surroundings that capture what’s happening, rather than what has happened. Divert your gaze from the city’s landmarks and study the detail of your neighbourhood. The terraces have a story to tell.